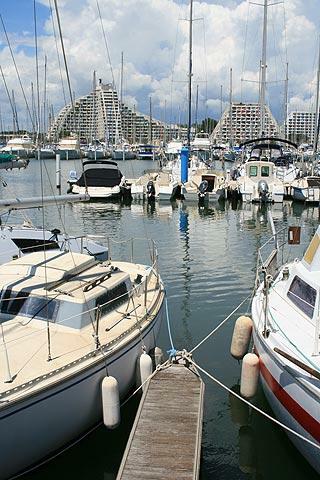 La Grande-Motte is a popular coastal resort in the northern part of the Languedoc-Roussillon region. 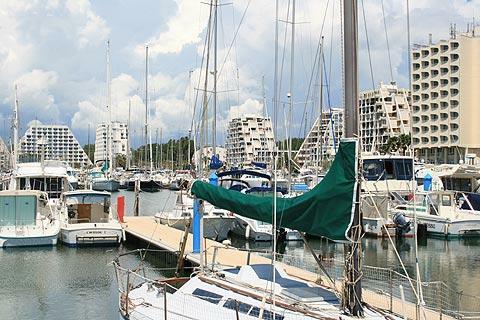 It has an attractive beach and harbour, and is one of the more impressive and distinctive developments along this coast. It's quite hard to describe the resort, and you will either love it or hate it's unique character (I love it - as do 2 million visitors each year). 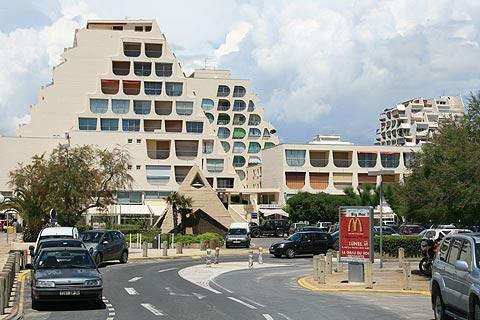 La Grande-Motte consists very largely of very easily identifiable 1970's style hotels and buildings, many featuring the shapes and colours that were popular in designs at that time, both behind the beach and around the extensive port area. The buildings are well designed, almost like a childs game from the period, and personally I found it very interesting and stylish. The 'main' building is the 'Grande Pyramide'' (although 'big twisted pointy building' might be a better description). 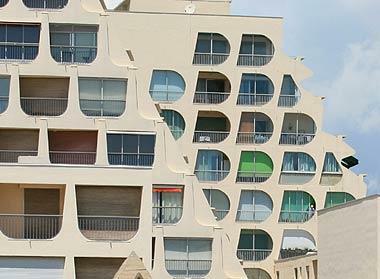 The design was apparently based on Mexican pyramids! There are also some statues and artwork of the period sprinkled around the town and along the waterfront. Away from the beach the resort remains pleasant with plenty of greenery, parkland, and broad safe roads. Note; the unusual style of the resort means that the town is now widely studied and used as a model for other similar developments, and in 2010 was the first coastal resort in France to receive an award for the importance of its 20th century heritage and design. If you are interested in learning more about the architecture and town planning here the La Grande-Motte tourist office have a leaflet with a suggested route for exploring the highlights (and also offer guided tours). The public beaches at La Grande-Motte are the main attraction, and rightly so. There are several kilometres of sandy beaches here (the central beach, and east and west beaches), which are clean, have a large area supervised by lifeguards, and are mostly accessible to disabled people. There are also several private areas of beach. The beaches have been awarded the 'Blue flag' award for their cleanliness and facilities. Golf enthusiasts will love the golf course on the edge of la Grande-Motte, which was created by one of the world's leading designers of golf course and includes two 18 hole courses and a shorter course with six holes. There are also more than 30 tennis courts (some covered) and a large sailing area, and both children and adults love the 'treetop' adventure park. 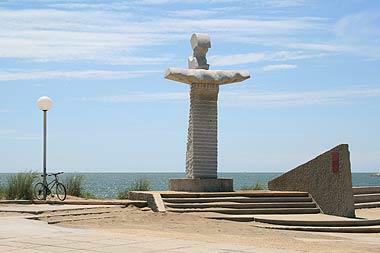 The town has easy access to the Camargue region, a region of natural beauty and wildlife to the east of La Grande-Motte. Two other particular highlights in the area that we recommend visiting are the fortified town at Aigues-Mortes and the small port town of Saintes-Maries-de-la-Mer (a little further but worth the trip). Regular market(s) are held in La Grande-Motte each Sunday.